There are many opportunities to include cover crops in the rotation. The goal is to keep the soil covered with at least 30% crop, cover crop or residue, 100% of the time. A second goal is to have living roots in the soil as much as possible. 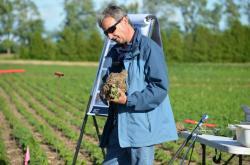 Research at University of Guelph, Ridgetown Campus has shown that planting a cover crop provides a benefit, even if the growth is limited. So consider the options below and find a way to reap the benefits of cover crops. There is a fair bit of interest in interseeding cover crops into standing corn. Different seeding times have been tried from the five to six leaf stage of corn to tassel stage to when the canopy begins to open up late summer or early fall. The most success in Ontario has been with seeding annual ryegrass and/or a clover at the 5 to 6 leaf stage of corn. Some growers have developed equipment to plant the cover crop or to move some soil after broadcasting the seed. Most broadcast the seed. Seeding rates are generally: 15 to 25 lbs/ acre for ryegrass. A good general rule of thumb for broadcasting cover crop seed is to add 20% to the drilled in rate. It is important to think about the herbicide program when planning to interseed into corn. Refer to table 1 for a listing of herbicides that can reduce the success of the cover crop. Table 1: Potential for injury to ryegrass and clover cover crop interseeded in corn. Some growers have interseeded cereal rye into corn as the crop begins to mature or even after harvest and have achieved enough growth late fall and early spring to provide some benefit. The rye was seeded at 60 lbs/ac. When winter wheat as a crop is not an option after soybeans, consider seeding a winter cereal as a cover crop. The most common option is rye but any winter cereal will do such as wheat, barley or triticale. Broadcast 60 lbs/ac at 10% leaf drop or drill it in immediately following harvest.